Sundaes are a summer tradition that shouldn’t end because you’re being more calorie-conscious. 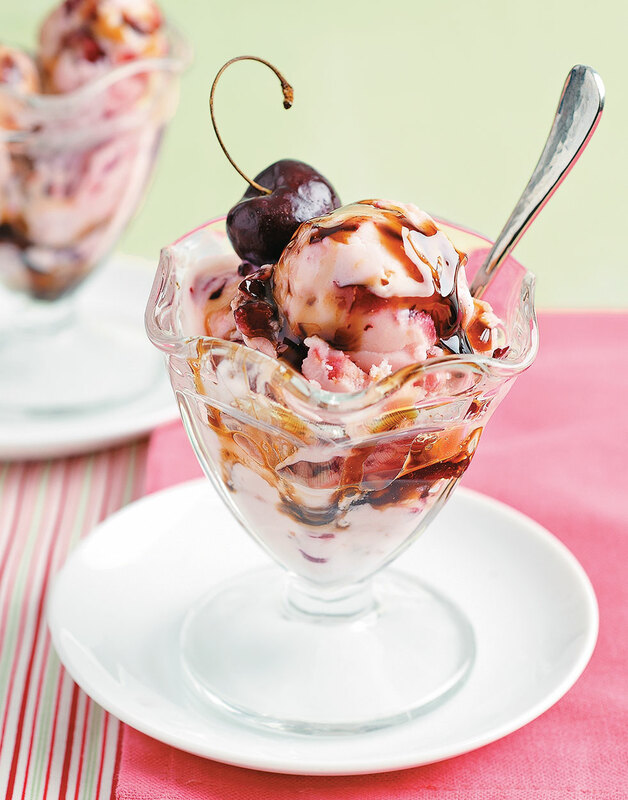 Being able to enjoy this creamy, decadent, old-fashioned treat for only 205 calories is the cherry on top of this sundae! The secret to keeping calories at bay is using lower-fat Greek-style yogurt. It’s a type of strained yogurt that yields a thicker and creamier end product. Whisk together yogurt, sugar, corn syrup, and vanilla in a large glass measuring cup until sugar dissolves. Chill yogurt mixture at least 1 hour or up to 24 hours. Pour yogurt mixture into the chilled canister of an ice cream machine and freeze according to the manufacturer's directions. When yogurt is thick and nearly churned, add the chopped cherries. Transfer frozen yogurt to an airtight freezer-safe container; freeze until solid. Stir together root beer and sugar for the syrup in a small saucepan over medium-high heat. Bring to a boil, reduce heat, and simmer until reduced to a syrupy consistency, about 25 minutes. (You should have about 1/2 cup syrup.) Chill syrup until ready to serve. Thaw frozen yogurt at room temperature 10–15 minutes for easier scooping. To serve, scoop 1/2 cup frozen yogurt into each sundae glass. Drizzle 1 Tbsp. syrup over each serving. Thoroughly whisk corn syrup into yogurt mixture. It helps the yogurt stay soft during freezing. Add yogurt base to machine’s chilled canister while it’s turning to avoid freezing on the sides. Reduce root beer until it coats a spatula. Watch closely, as it can scorch quickly while reducing.